Various National & State Entrance exams are held in India for students who are planning to pursue their career in LAW. These Law entrance exams are held for both admissions in undergraduate & postgraduate programmes or 3 years LLB programmes even after graduation. You can even go for LLM after LLB; Pursuing law is itself an important course after MBA & Medical. 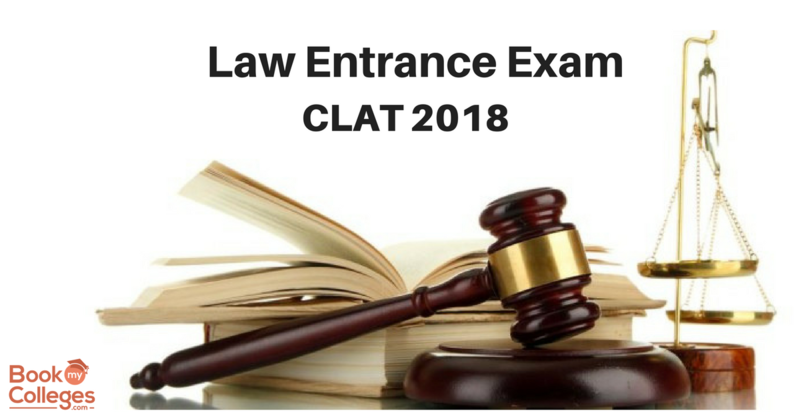 CLAT 2018 Common Law Admission Test (CLA) is one of the vital law entrance exam conducted by National Law Universities (NLU). It’s all India Level LAW Entrance Exam in 2018. This Law entrance exam is organized for admission in UG, PG and Integrated law courses of different National Law Universities in India. CLAT Entrance Exam will be held online on 13th May 2018. · Students can download admit card on 20th April 2018. · Admit card will be issued online only. · Don’t only carry CLAT 2018 Admit card on Exam date, Carry Identity proof along with you. Have completed their 10+2 or equivalent examination with a minimum of: Forty Five percent (45%) marks in case of candidates belonging to General/OBC/Specially abled persons categories. Forty percent (40%) marks in case of candidates belonging to SC/STcategory. Comprehension passages and grammar, Vocabulary, Fill in the Blanks, Correcting sentences, etc. Number System, Percentage, Profit and Loss, Time and Work, Height and Distance, Geometry, Algebra, Trigonometry, etc. Syllogism, Logical sequences, Analogies, Blood relation, etc. For Details Regarding LAW Colleges You Can Call or Write us at 9644440101 | Ashita@bookmycolleges.com!